I accidentally stumbled across a blog post on a national floristry stockist website that has me in a huff about the tactics used in traditional retail florist business. You know, the main street, candy floss, plastic fantastic flower shops you find in local shopping strips or in between train station platforms. There’s no value in this for anyone, especially our customers! It’s not their fault you bought too much stock! As consumers, we expect only the freshest ingredients in the food we eat for ourselves and the food we feed to our kids and our pets. When we eat out, we prefer to eat made-to-order meals rather than 5-day old hamburgers and parmas. Hands up, who in the retail food market, given a fair choice, would pay folding money for last Wednesday’s chicken dinner, when you can have a fresh one prepared while you wait?? So why is this seemingly common practice for retail florists? Why are we not only offered made-to-order arrangements with only the freshest of flower stock? Farm-fresh cut flowers (depending on the variety) should provide you with about 2-3 weeks in the vase. We’ve done some testing to prove this. However, in our testing, we have realised that some fat stem blooms can cloud and odour water quicker than some other varieties (not always, but often), so we now include a little satchel of flower food to counter this with each bouquet we deliver. Bringing home flowers that wilt, brown and die three days later is tacky and sad – even for a super cheap price – so don’t risk the buyers’ remorse and buy fresh every time. Know that our flowers are collected farm fresh on the morning that we make and deliver – so there’s no need to settle for dying excess floral stock when you have the option to give long-lasting flowers to someone special and enjoy them for a fortnight or more in your own home or at work. This post was originally titled “A’la Carte Flowers, every time” until we realised that the menu itself wasn’t actually a requirement either! We have a great seasonal range of curated and designed bouquets to make it easier to get or send the freshest of flowers – though did you also know that you can have a custom bouquet designed especially for an occasion or a special personality? Have a friend that just lurrvves Hellebores? 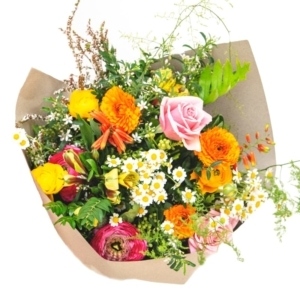 Want to send a bouquet, though your partner is pollen sensitive? Have an occasion but our options just don’t match the statement you want to make? Send us a request or pick up the phone and we’ll make it up just for you for not much more than our standard menu items, delivered as usual, fresh from the farm.